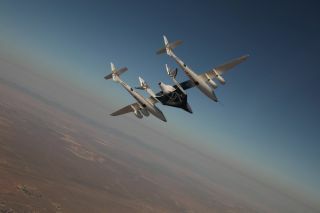 The Virgin Galactic suborbital spaceliner SpaceShipTwo makes its first crewed flight on July 15,2010 over the Mojave Desert in California, one of a series of test flights before the first free flight of the passenger ship for space tourism flights. Full story. By 2014,a ticket for suborbital flight is likely to cost between $50,000 and $100,000as the industry develops to offer hundreds or even thousands of flightsannually, according to a panel of experts speaking Friday at the Space FrontierFoundation?s annual conference in Sunnyvale, Calif. The most optimisticestimates were offered by Lee Valentine, executive vice president of theSpace Studies Institute in Princeton, N.J., and an investor in XCOR Aerospaceof Mojave, Calif., and David Masten, chief executive of Masten Space Systems ofMojave, who said the industry would be offering between 1,000 and 100,000flights annually. Incontrast, A.C. Charania, president of the SpaceWorks Commercial consultingfirm, estimated that the market would offer ?at the low end hundreds of flightsper year and at the high end thousands.? While Charania lamented that no recentstudies have been conducted to gauge public interest in suborbitalflight, he said existing data suggest the high price of tickets might determarket growth. ?Peoplehave put down money to fly on [Virgin Galactic?s] SpaceShipTwo,but what is the long-term viability of the market?? he asked. ?After thosepioneers fly, is this a sustainable service? We have a question on that fromthe analysis we?ve done.? Panelistsalso discussed prospects for future markets beyond suborbital tourism. Charaniasaid the suborbital market may evolve to offer global, high-speed,point-to-point transportation. Douglas Maclise, manager of theCommercial Reusable Suborbital Research Program (CRuSR) at the NASA AmesResearch Center in Mountain View, Calif., said the market for researchexperiments is extremely promising. Maclise declined to offer an estimate ofhow many people would travel on suborbital flights in 2014, but said ?therewill be thousands of payloads.? CRuSR is a space agency initiative announced inFebruary to offer microgravityflights for technology development, scientific research and universityresearch projects. Space News, dedicated to coveringall aspects of the space industry.